At the twilight of a storied career and battling a brain tumor, Sen. John McCain stands poised to deliver for his party and his president on the issue that's defined the GOP for the past seven years. It's a situation heavy with drama and symbolism. The 80-year-old Arizona senator will return to Washington just days after a cancer diagnosis, to cast what could be the deciding vote Tuesday to open debate on legislation to repeal and replace "Obamacare." It's an issue that McCain himself campaigned on heavily last year as he won re-election to a sixth and almost certainly final Senate term. 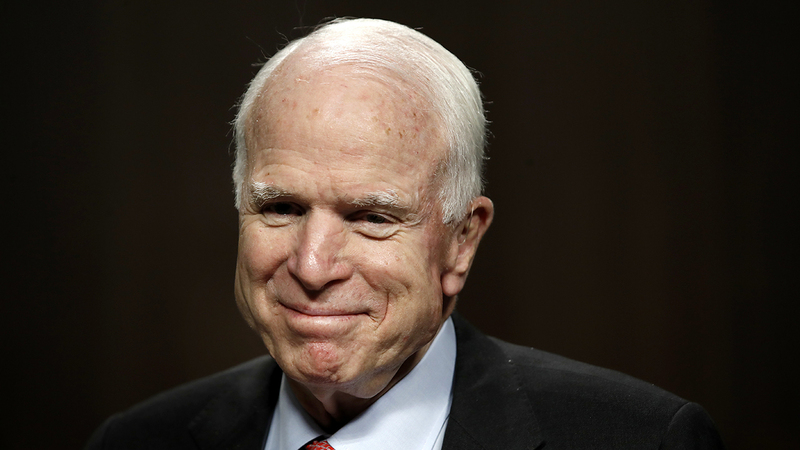 And for McCain, there could be sweet revenge in defying cancer to undo the signature legislation of the man who beat him for the presidency in 2008, Barack Obama. McCain would also deliver a key victory to President Donald Trump, despite emerging as one of the president's most outspoken GOP critics on Capitol Hill. And the situation was eerily reminiscent of a similar scenario involving McCain's good friend, the late Democratic Sen. Ted Kennedy of Massachusetts, who returned to the Senate in July 2008 while battling brain cancer to vote on Medicare legislation, his dramatic entry in the chamber eliciting cheers and applause. Kennedy died of cancer in August 2009. The possibility of McCain returning had been discussed around the Capitol on Monday, yet the bare bones press release from his office came as a surprise.